Designed for use in the shower, this K•Care Shower Stool has a weight capacity of 110 kg and a seat area of 360 W x 310 D mm. The padded seat can easily be removed for cleaning/replacement and the height and angle can be adjusted. There are arms to provide support to users while sitting or transferring. Rubber tips on each leg provide anti-slip stability. 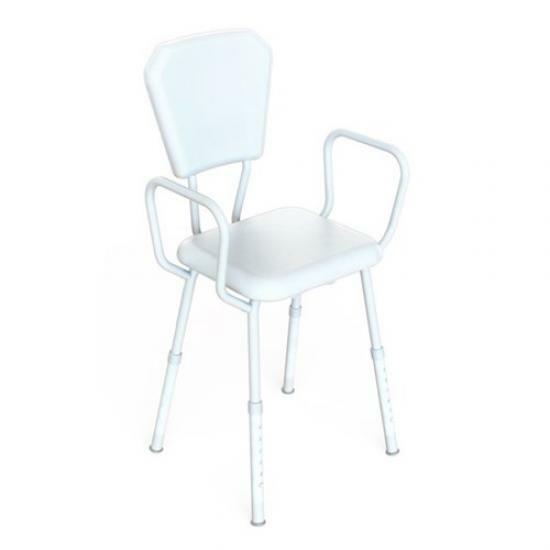 The shower stool is durable with an epoxy powder coated zinc treated mild steel, white frame and water proof polyurethane seat and back rest. Adjustable height and angle to suit the occupant and uneven floors. Padded back rest for comfort and support. Arms to provide support when sitting or transferring. Clip-on moulded plastic seat for easy cleaning. Epoxy coated zinc treated mild steel frame.